London Fashion Week has been an exciting and jam-packed week for Aspinal. 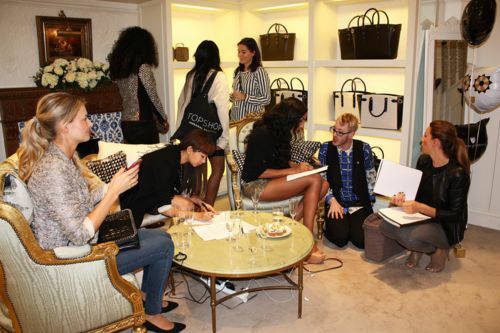 We've hosted two successful fashion-filled events; Lending Lounge party and the street-style talk at Oxford Street's House of Fraser. Tuesday night saw our flagship Brook Street store hold the Lending Lounge Launch party. A number of guests, including fashion's finest Caroline Flack, Lilah Parsons and Billie JD Porter, were treated to drinks, Nails inc manicures, Vidal Sassoon pampering, Seekers of Sun luxury temporary tattoo's (made famous by the one and only Beyoncé) and of course got the chance to try out a selection of Aspinal's new sophisticated Autumn/Winter collection of bags. The Lending Lounge itself was almost cleared out as a special few took home a bag of their choice to borrow throughout London Fashion Week. To support the launch of Aspinal's pop up shop in House of Fraser Oxford Street, on Saturday the 13th, Aspinal held a street-style competition, fashion and career talk and balloon takeover on the ground floor. The stylish fashion set were joined by presenter Laura Jackson and Coco's Tea Party blogger, Ella Gregory as they discussed all things fashion, style, careers and trends with all receiving an Aspinal of London goody bag. Of course, we were joined by one of Aspinal's most cherished guests; the Aspinal Polar Bear! Let loose around Oxford Street, he was soon seen charming and even sharing photos with passers-by. Our Instagram was filled with #PolarbearSelfies! Against a balloon backdrop, a street style competition was held in partnership with Elite London, whereby fashionable passer-by were snapped with some of Aspinal's newest pieces for the chance to win one of Aspinal's iconic bags. The fun continued as thousands of owl balloons, hundreds containing Aspinal vouchers, were 'released' all over London. The lucky few who found our voucher balloons were entitled to spend their prize in our Covent Garden or Brook Street stores over the weekend. How was your fashion week? Let us know in the comments below.